Walhonde Tools, Inc. is a West Virginia company that credits manufacturing assistance from TechConnect West Virginia’s Startup WV Manufacturing program as being instrumental in successes that are helping ensure the company’s growth and expansion. enhance safety, eliminating most pulling devices. 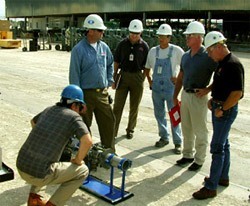 Walhonde customers include many Fortune 500 companies, the U.S Navy, NASA, contractors and international concerns. The company is a participant in Startup WV Manufacturing, a program funded by the U.S. Economic Development Administration and administered through a partnership of TechConnect West Virginia and the Robert C. Byrd Institute for Advanced Flexible Manufacturing (RCBI). By making the latest manufacturing technology available to companies, they can expand and create economic growth. Walhonde has been involved in the StartUp program for several months and is realizing tangible, significant benefits as a result. Matthew P. McClure, Walhonde’s Tube & Pipe Tooling Manager, said Walhonde foresees a 50 percent production growth during the next two years, which he anticipates will enhance hiring opportunities from the revenue that this opportunity offers. McClure said the StartUp West Virginia Manufacturing program has given a face-lift to its products and “these improvements have opened doors to a large pipe-fitting company that before viewed our product as being insufficient.” As a result of the success of Walhonde’s participation the program, he pointed out that the company has hired a new full-time position and two part-time workers. He said he hopes to add another full-time machinist position in the near future.